Have you ever noticed how color can make you feel a certain way? I've been paying attention to color a lot lately. Especially color that is in my home. When I was younger, I loved red; red clothes, red rooms, red pillows, red blankets, red plates...and all things red. If I needed a pop of color, red was my go to inspiration. But now, as I've gotten older, I'm drifting to softer colors. Colors that make me go "ahhhh" when I see them or think how pretty something is just by it's shade. I still like color. I just like it to be softer and not quite so vibrant. 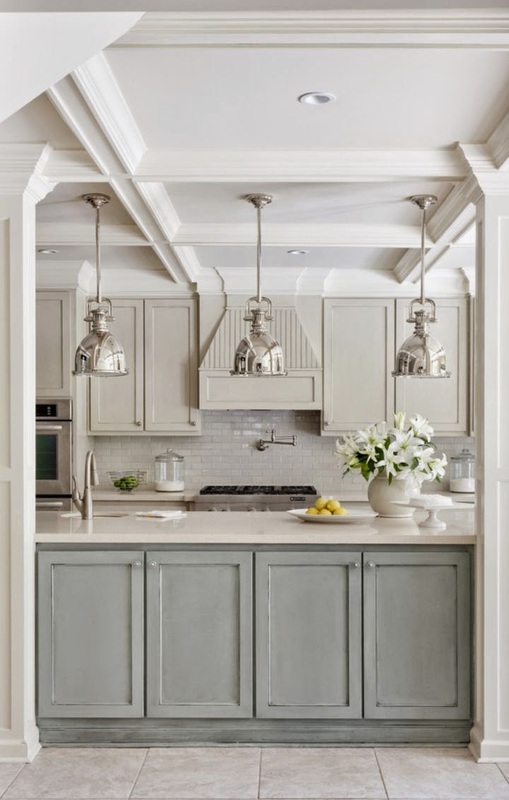 As I look over my home pins on Pinterest, there is definitely a color or shades of color that I am gravitating towards. I never really thought of myself as a blue or green person but these shades are working for me. Look at some of my recent pins and you can see what I'm talking about. 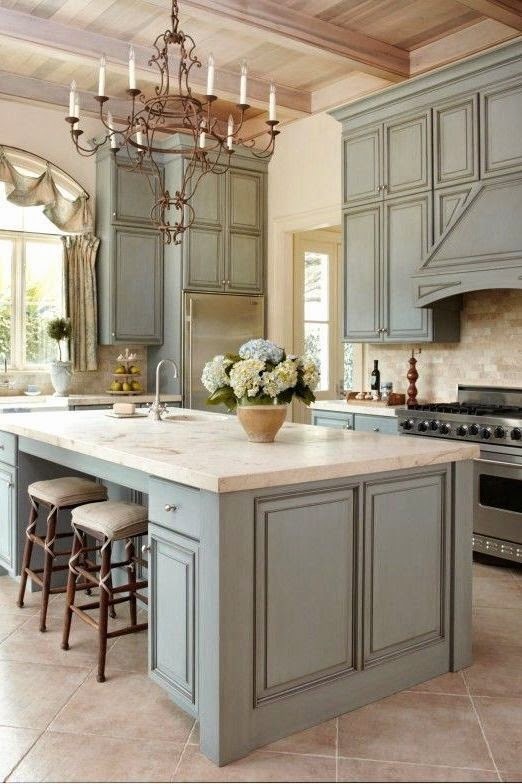 For me, there is just something soft and pretty and calming about this color. 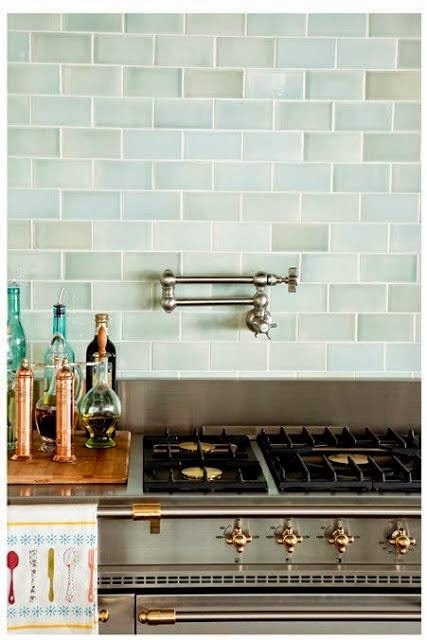 I think I'm gravitating towards this color, because it reminds me of home. A safe place where we can be ourselves and nurture those around us. 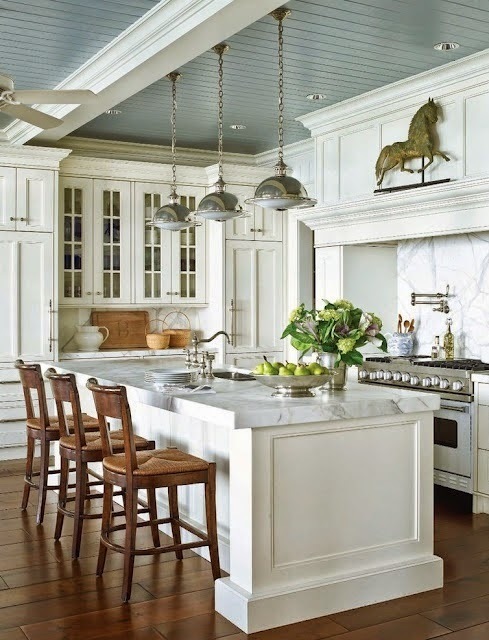 Do you have a color that you gravitate towards? 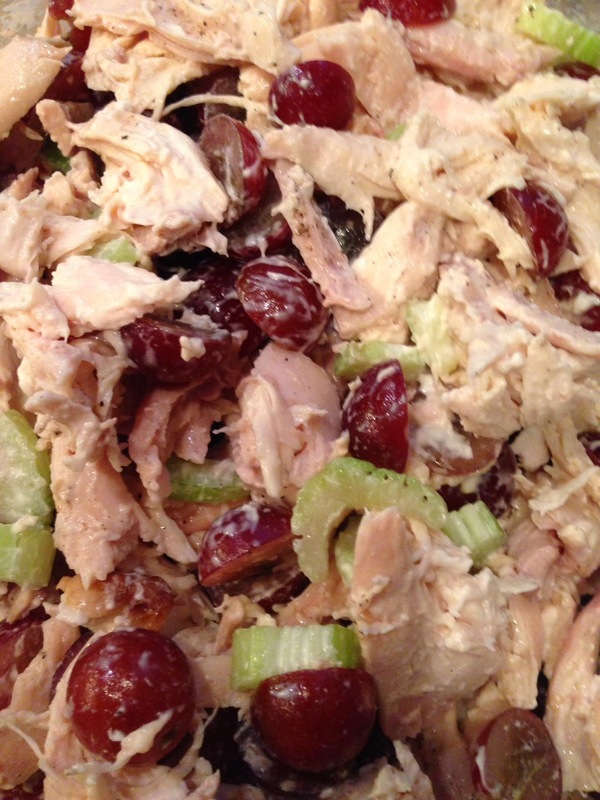 Twenty some years ago, I went to a BFF bridal shower and had this yummy chicken salad. 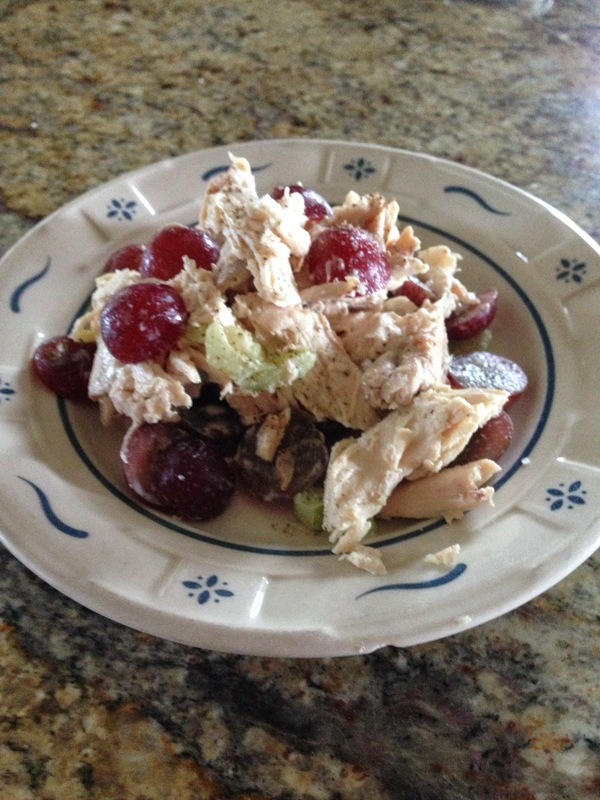 It was the best daggone chicken salad I have ever had and to this day, it continues to be one of the best! And you aren't going to believe how easy it is to make and how good it is for you. This is the perfect salad to make ahead of time and put in the fridge for lunch the next day or a quick snack. It is lean and filled with good things so it will fill you up. You can serve it plane, add it to a salad or throw it on some good bread. The easiest way to make this tub of goodness is to buy 1 or 2 rotisserie chickens. In my house I have to buy two because one just doesn't feed everyone. Pull off all of the chicken and either cut it up or shred it with your hands and place it in a bowl. 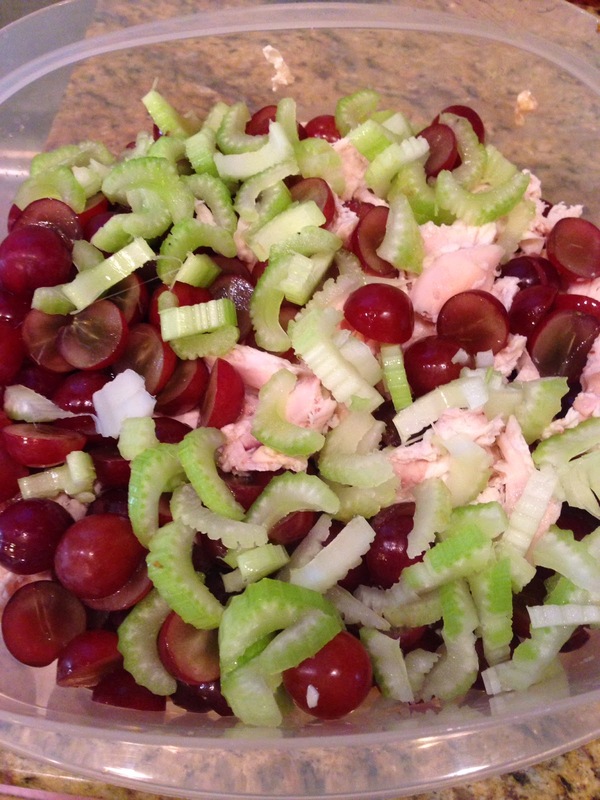 Chop up a bunch of red grapes and a bunch of celery. Sprinkle in some almond slices (or not, if you don't like nuts). Use just enough mayo (I use Hellmann's olive oil mayo) to make it all stick together. Sprinkle with sea salt and crushed pepper and add a tsp of oregano. Mix is all together and go for it! You can also add a tsp of dijon mustard to the mayo and a little bit of tarragon leaves and it takes on a different twist. My entire family loves this. I've served it many times at large gatherings and it's always a hit. Try it! Play around with this and make it your own. It is so good!! Being a parent is hard. I have heard this many times over the years but let's get real for a minute. It's not just a little hard sometimes.... it's unbelievably hard sometimes (yes, I know there are many great rewards for hard times, but we aren't talking about those today :). We are talking the hard when two heads collide. That little bundle of joy comes home with you and you think you are going to be the best mom, parent and friend that this little baby has ever had and you are going to live happily ever after. That is true right up to the stage where you go from being a super hero and the best mom ever to....."what do you know?" It's the stage where your child turns into a small adult, having his or her own opinions and of course, many times, their opinions differ from yours. These opinions can sometimes greatly differ from yours. Their choices many times are not ones you would make and you think....how did this happen? How could they be making decisions so different from what I would do? Didn't I teach them right? Didn't I give them the tools to work through these issues? And worse yet, you begin to question all of those agonizing moments where you had to say "no" or discipline them in some way to help teach a valuable lesson. Or perhaps, you missed the lesson to begin with. The reality...is there is no manual for raising our children. Oh sure, there are books about being a good parent and strategies for building a strong confident child (I never read them, but I see them looming at me in the book store now more than ever). But every child is different and every situation is different. So with that, every outcome is different. Sometimes I want to throw my hands up and shake my head with that ever dreaded feeling of "I don't know what to do here." I look to the sky or bow my head and say...."ok...God, I need you to intervene here cuz clearly I am out of my league and I have no idea what to do with this one." It happens and I know it's all part of the process to get your child where they need to be and get you to where you need to be. We all have our life lessons and we need to allow our children to grow and learn from mistakes just as we did. I don't pretend to know it all (although my children might say that I do). What I do know, is that I love each one of my children more than they will ever know. I want only good things for them and want the best that life has to offer. Isn't that what we all want? I know I'm not perfect and I make mistakes....all the time. I need to work on letting them know that it's ok that they think differently than me. I need to work on letting go a little bit more so they have the freedom to make their own choices, stumble, fall and pick themselves up. I need them to know that there is no perfect choice or perfect path in life. They have to choose what is best and then choose some more along the way. There is beauty in our imperfections and our imperfect lives. I hope that one day, as my children look back, they will see my intentions and imperfections as they are and understand that I was making the best choices I had at the time, as a parent, to love them through their journey. I think it is through our imperfections, not just our successes, that we shine and become who we are suppose to be. I have fallen in love with cows lately. Maybe it is an age thing, I'm not sure. When I drive up to my parents house in Northern Virginia, I pass through these little farm towns as I make my way up through Warrenton. I see cows slowly wandering the fields and just standing at their fenceposts looking all calm and peaceful..... like there isn't a worry in the world. Wouldn't it be great if we could all find that place of contentment on a daily basis? 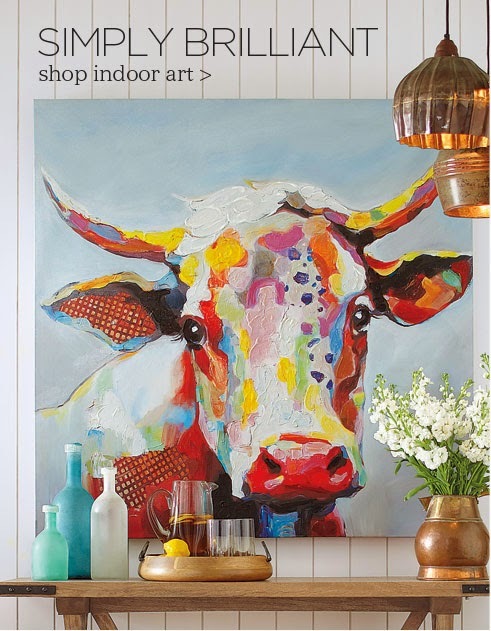 Bessie wall art is found at Grandinroad. If I had a place for her, I'd certainly bring her home. 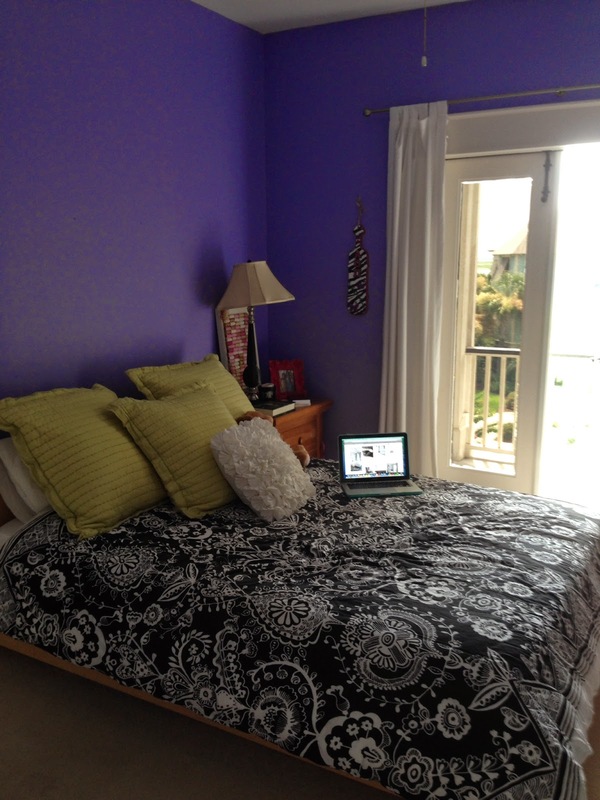 Remember the purple college room? 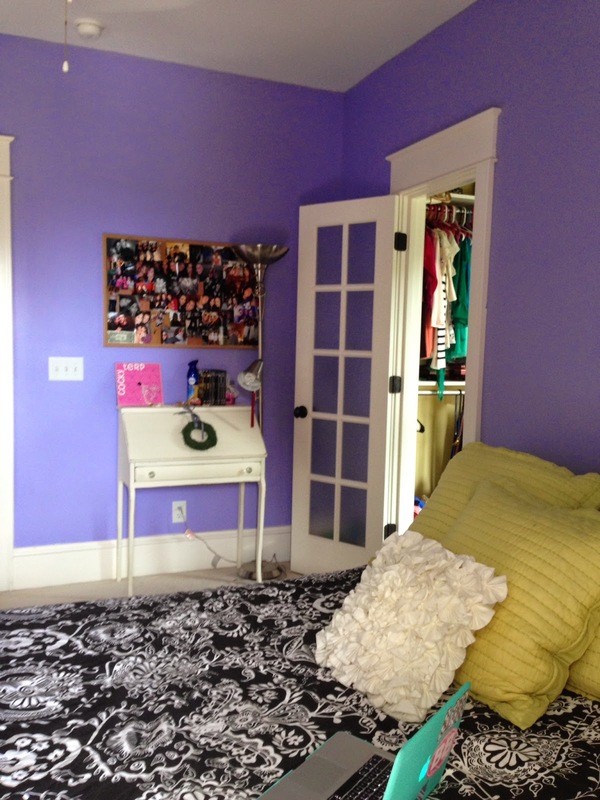 Well that purple room is now a beautiful soft gray. 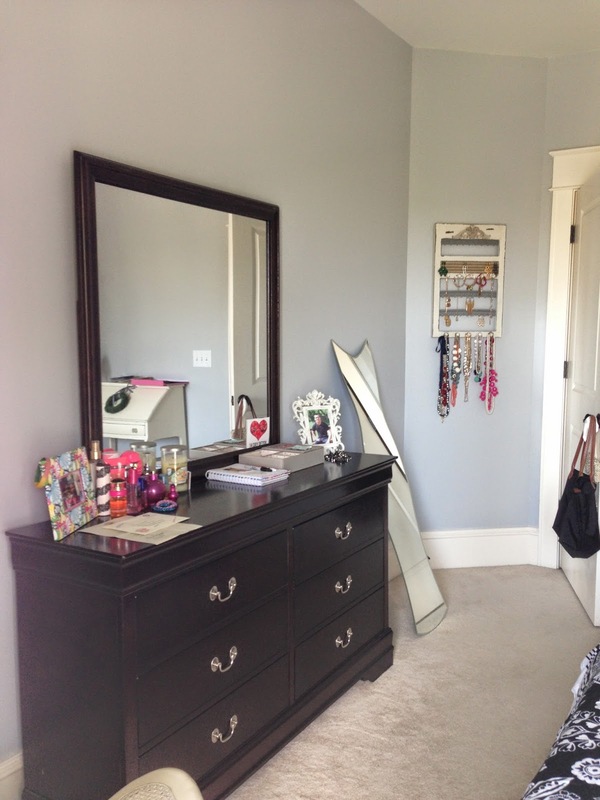 We chose Chromium gray from Lowes. 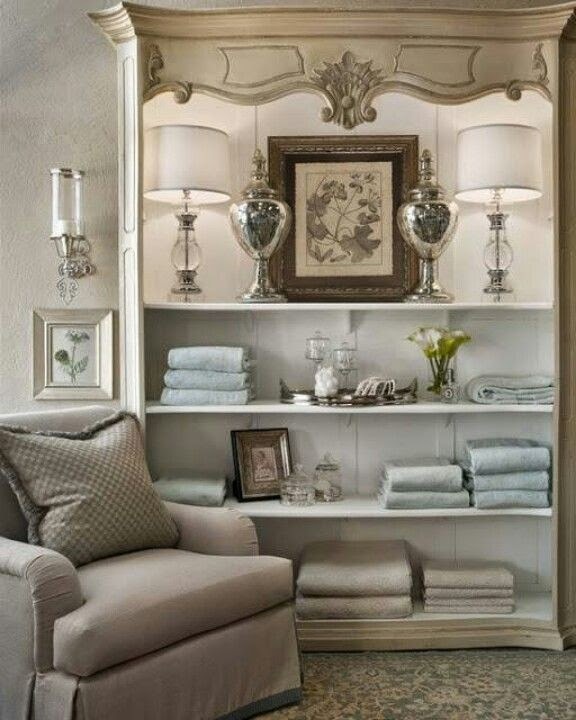 It is the perfect gray for this room. I was going to wait until all of the decorations were up but several of you asked to see if I had painted it yet. So yes, the hard part (which really isn't hard) is done. 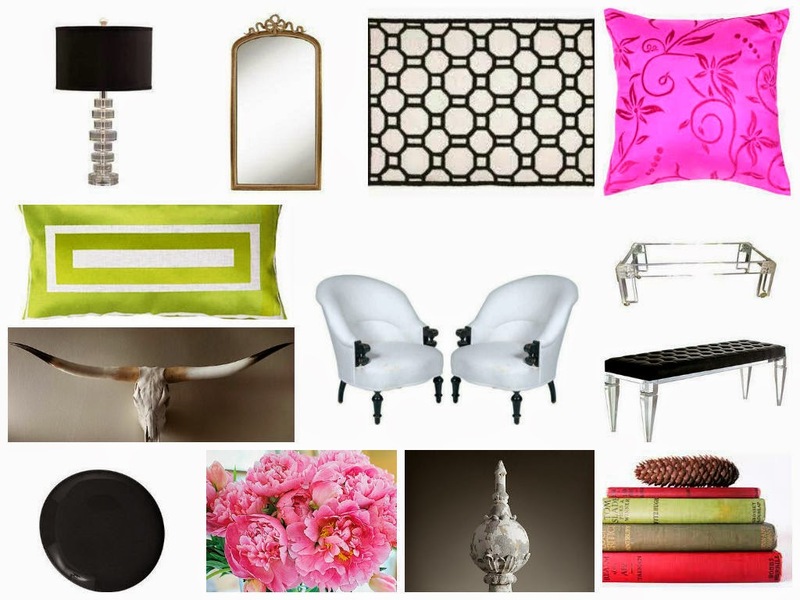 Now we are looking for some cool wall art for above the bed and a few pretty things to finish off the room. Doesn't it feel so much better just looking at it? Here was the before in case you want to what it looked like before we started. 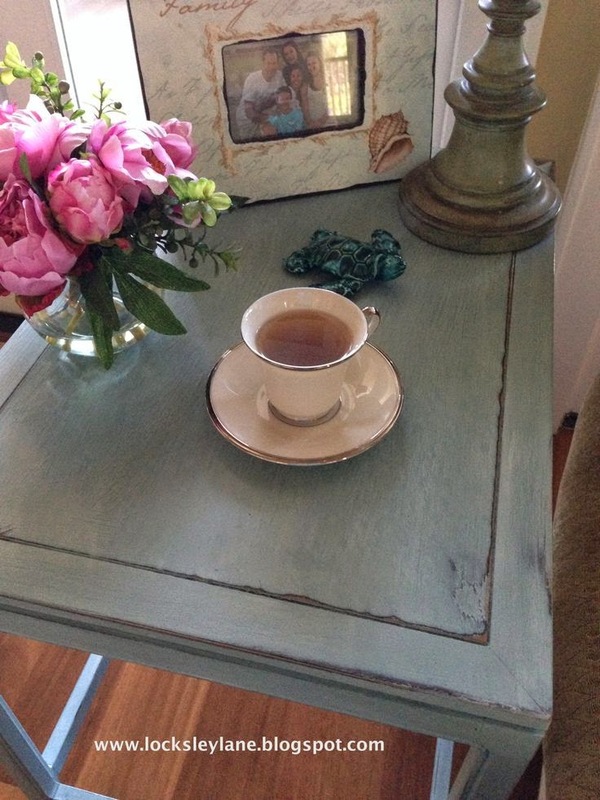 Happy that tastes change and painting a room is so easy to do. Don't be afraid to change that paint! Sometimes we are cruising along doing all that we need to do and we get a little sign that we need to slow down. Maybe we are burning the candle at both ends or we are stressing over a life situation. Maybe our body needs additional time to re-fuel and energize itself. It is at these times, when the best thing to do is to sit back, take a deep breath and rest. Even if just for a little bit. 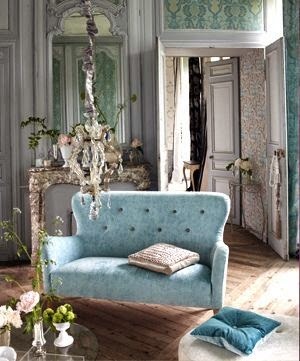 This chaise in this beautiful room found on Pinterest invites me to do just that. Maybe you can find your special place to calm yourself and sit back today......just for a few. And if you are lucky, take a needed rest. 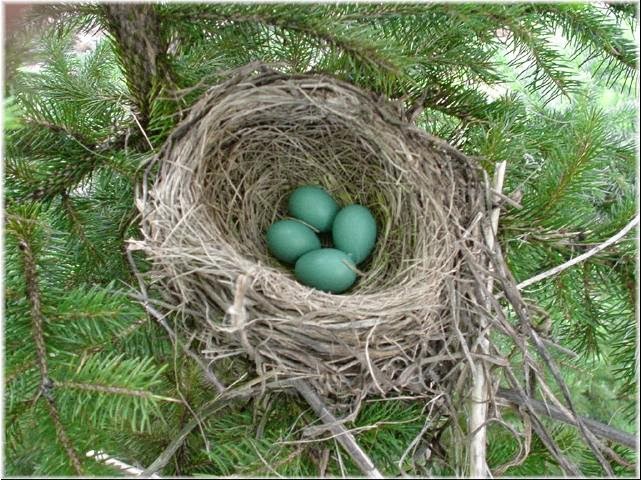 The girls and I were sitting around the other night when they both looked at me and asked...."what's for dinner?" With the boys gone, I was thinking that maybe I didn't have to cook.... :) I knew that I didn't have much in the house and thought we'd have to order out. Then I spotted a few things I knew would make a meal in minutes. 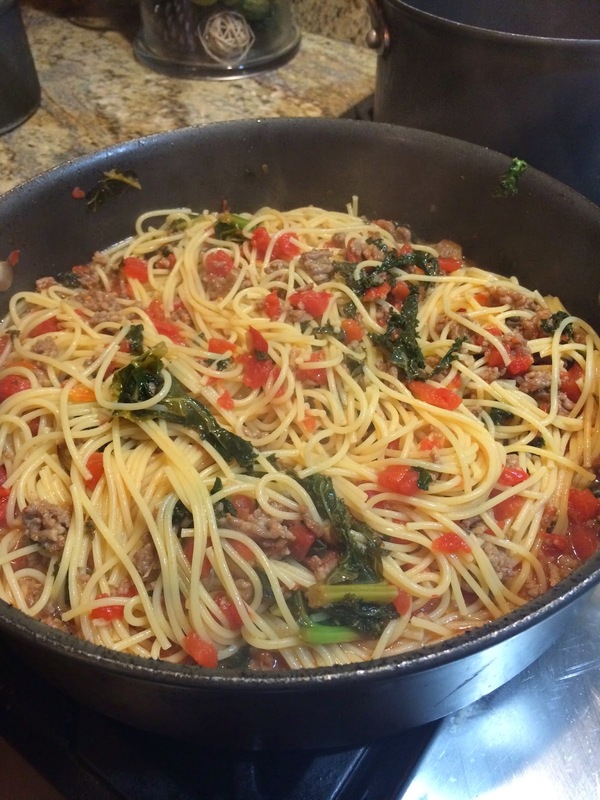 Here is another "go to" pasta dish when you need something quick. It is super easy and literally takes about 20 mins from start to finish. Start a pot of water to boil your pasta and add a tsp of salt. In a large pan brown a package of ground sausage. 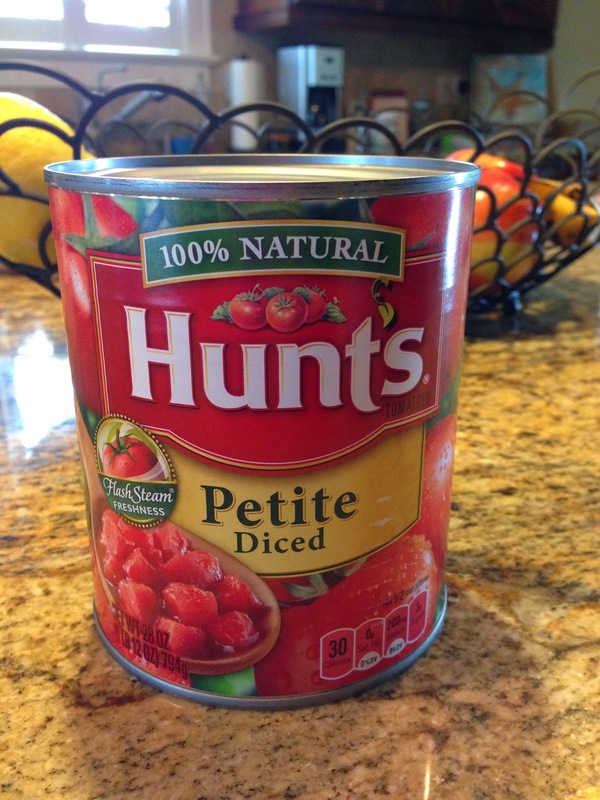 Add a large 28 oz can of Hunts diced tomatoes to the sausage. (I buy two of these every week. It's a great staple and allows you to make a meal in minutes). 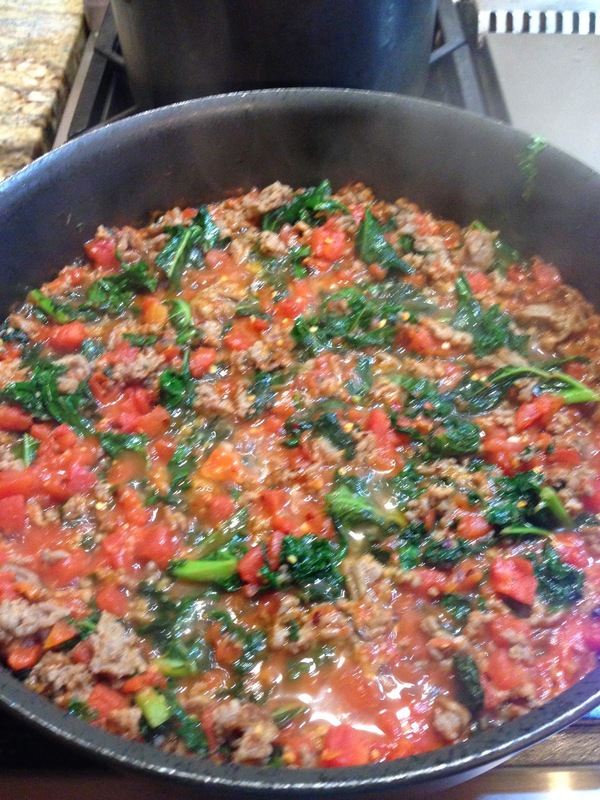 Add a cup of white wine and a couple of big handfuls of kale to your pan. Stir this so the kale starts to wilt. Add a little bit of red pepper flakes and a dash of garlic salt. Once your pasta is almost done, take a cup of the pasta water out and put it in the kale mixture. Let this simmer for a few minutes. Strain your pasta and add to the pan. Toss. Serve with a good grated cheese and a side salad. Perfect for a quick meal. So good and easy to reheat the next day. Why order out? 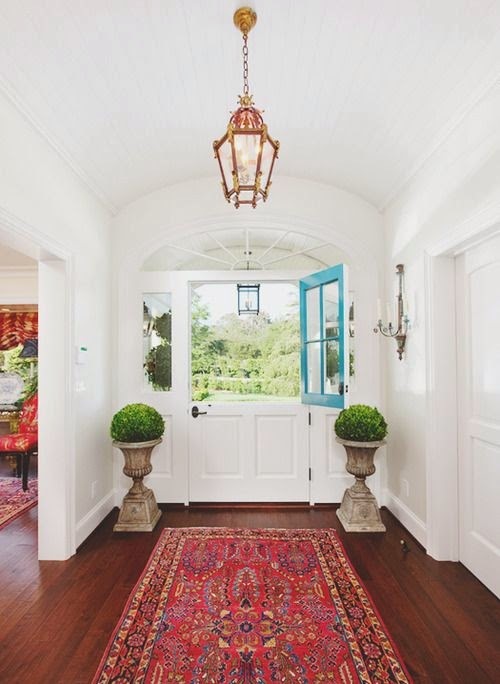 There is a fun online company called Chairish, that allows you to buy and sell high end, pre-loved decor through the web. 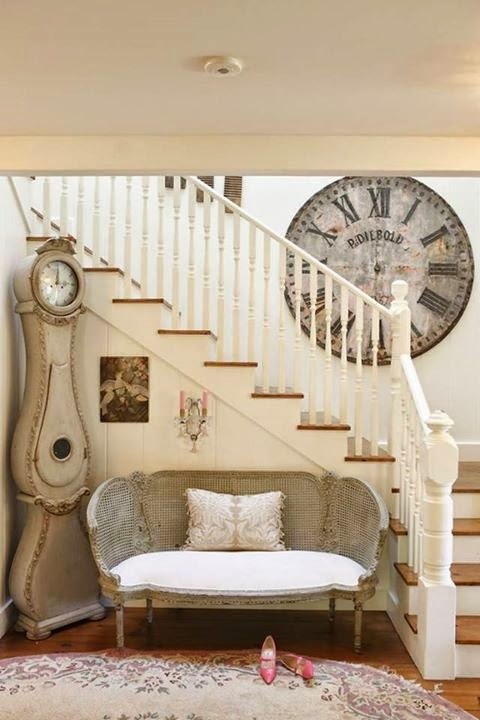 The shop features curator approved treasures from homes all over the US. 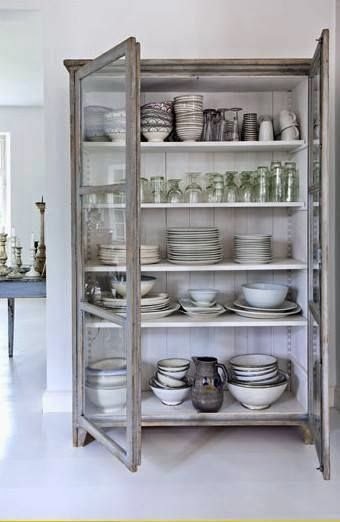 What was once a treasured piece in a home, may not fit in the next home. Chairish creates an avenue to sell that fabulous piece to someone who can appreciate its uniqueness and value. I took a pair of white Napoleon III chairs from Chairish and created my new imaginary living room. I imagined black walls and beautiful white drapes. I found a vintage lucite coffee table, bench and french gilded mirror from this website and found a bold geometric rug, pillows and other accents from Pinterest. The antlers are from RH and I just love them. 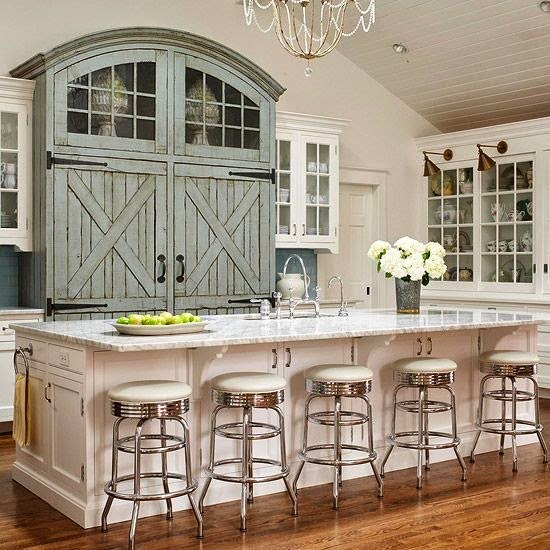 :) There are a whole bunch of different accent chairs that you can find on Chairish. If you are looking for a fabulous chair, I'm sure they have one that will fit your style. 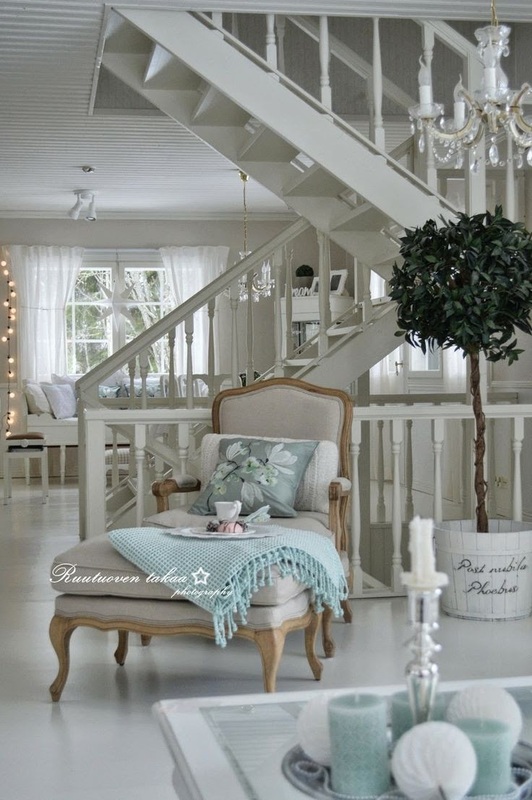 What would your room look like if you could go from white to bright? I used Fotor.com to make my collage above. Go ahead and make your own collage. It's a great way to put ideas together. 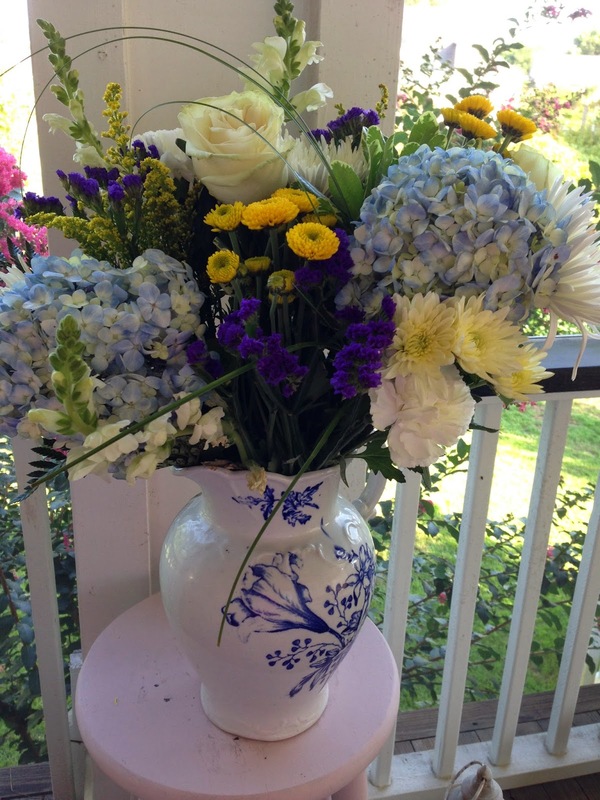 On today's blog I'm giving a shout out to my niece and all her peeps in Tar Heel country. Being college students and trying to eating healthy is not an easy task. Remember being in college? We ate a lot of mac-n-cheese, a lot of ramen and a lot of take out. Even for most of us today, trying to eat healthy and make good choices is not always easy. Enter the Avacado and welcome guacamole. 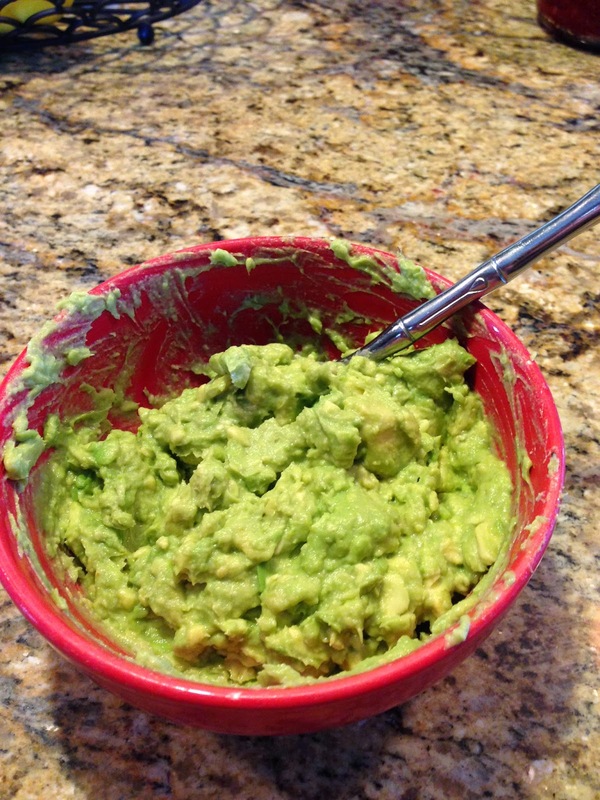 Guacamole is so easy to make and is a great protein snack or addition to a meal. Now I know what you are thinking... You are already worrying about all the calories and fat found in an avocado. Yes, there are quite a few calories in an avocado, but the health benefits far out weight the calories. 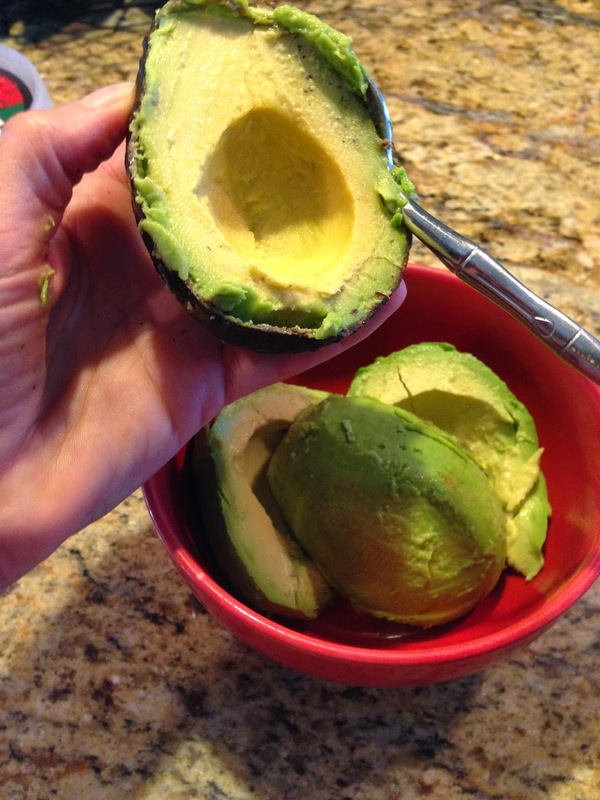 The avocado is packed with vitamin A, C, E, K, B6, Potassium and "healthy" fat. Yes, there are good and bad fats and you need good fats to function optimally. Eating avocados will improve your absorption of other nutrients from foods you are eating. Avocado's are good for your skin, regulate blood sugar and have anti-inflammatory and anti-cancer benefits. The fat in an avocado protects against heart disease. It is rich in omega-3 and provides all 18 essential amino acids for the body to form a complete protein! Over half of the total fat in an avocado is in the form of oleic acid - similar to the fat composition of olive oil. Low in sugar and low in carbohydrates it also falls low on the glycemic index. So.....why wouldn't we want to eat more of this yummy fruit! Let's make some of the best guacamole and worry about calories later. Take two avocados and slice them in half. Take the pit out of the middle and using a spoon, scoop out the green meat and put it into a bowl. Get all of the dark green part because that is the most nutrient. 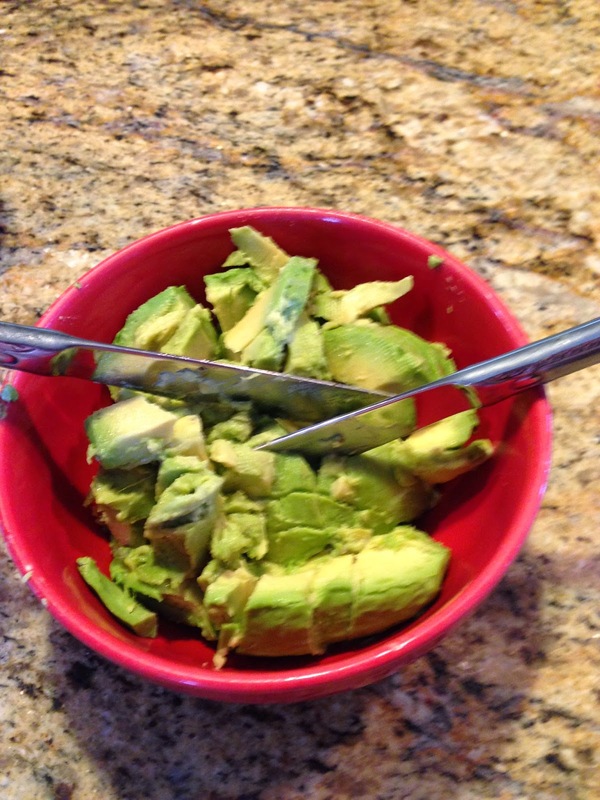 I use a knife to cut crossways across the avocado and then blend til creamy with a spoon. 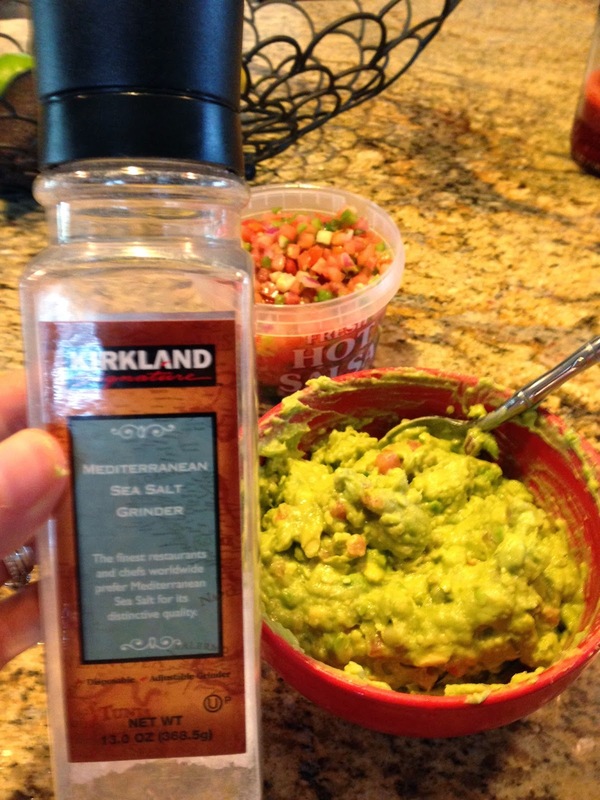 Get some fresh hot salsa (the hot adds a little spice to the guac) from the fresh food part of your grocery store. It is nothing but tomatoes, onions, green peppers and jalapenos. Most stores have this chopped and ready to go. It is all natural with no preservatives. Add some sea salt and use some good chips and you are all set. Don't be afraid to add salt! 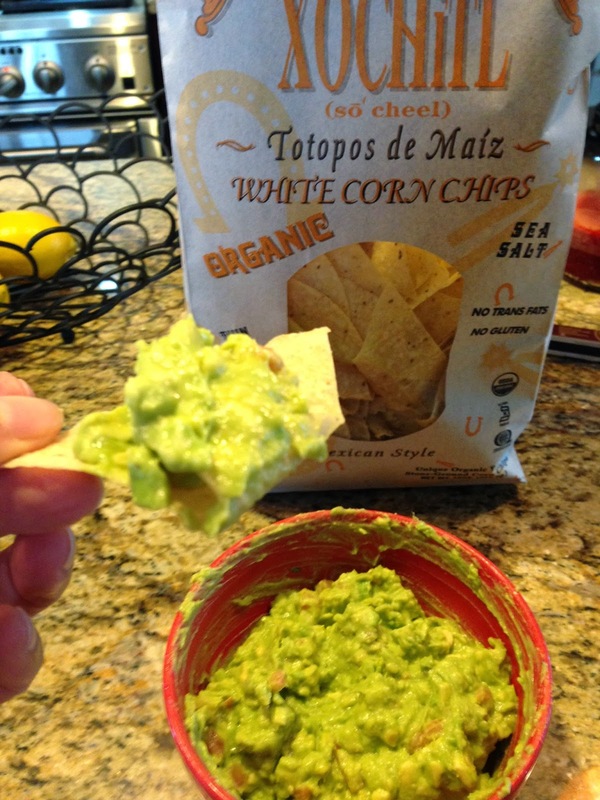 Now, don't go crazy with guacamole. It is high in calories and it is easy to eat a lot of it. But, if you make this for a group, it won't be around for very long. It is best to eat right before serving.... and when stored it turns an ugly brown. Fine to eat but not great to look at. 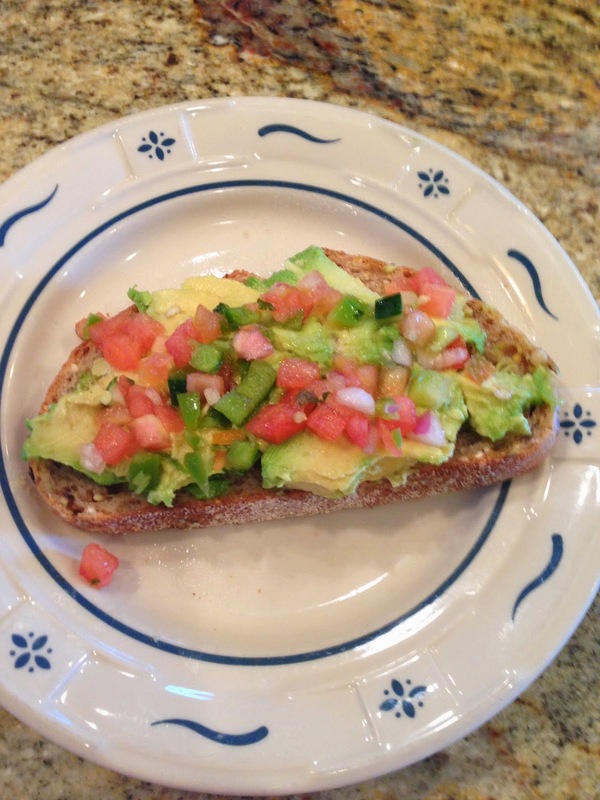 Another great way to eat avocado and salsa is on whole grain or ezekiel bread. This might be my favorite breakfast of all time! It's about 320 calories per serving. The good part about this if you are trying to watch your weight - is that this is filling AND it tastes great. It is slow to metabolize and will take you to lunch time without hunger pains. Part of why we don't keep to our healthy eating programs is because we crave really good yummy food. Well my friend......this is the bomb! 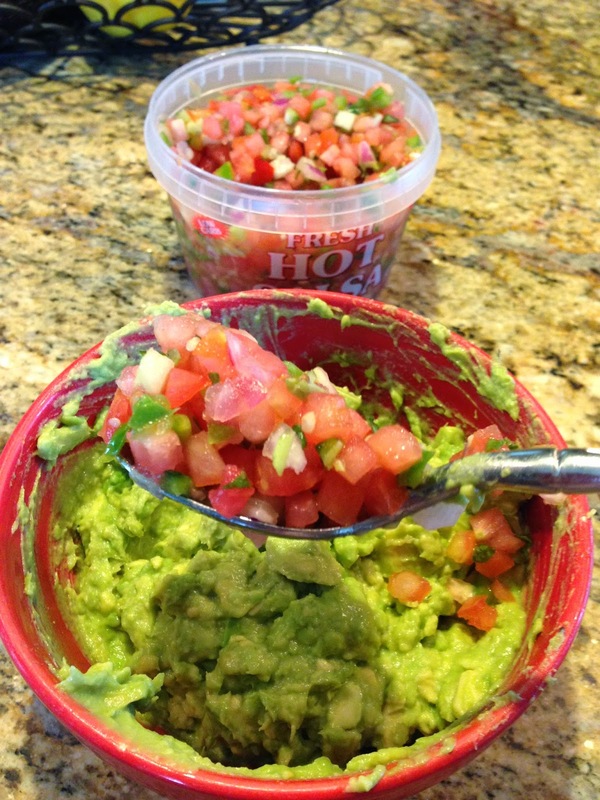 Put some guacamole in your life and a smile on your face. I promise it won't disappoint! 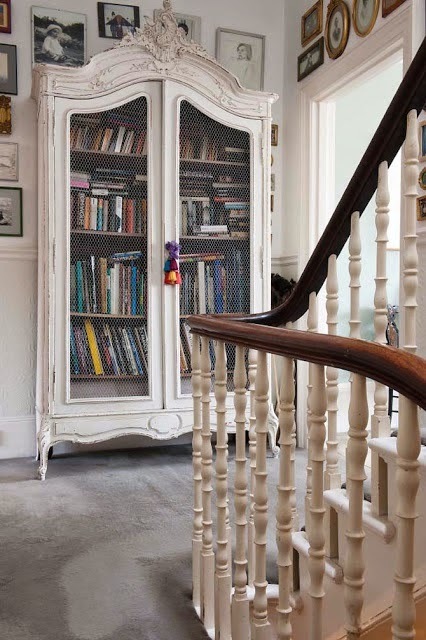 Do you have a big armoire or an old TV cabinet that is getting in the way and taking up space? Most of us do. If you have one that is getting in the way - don't get rid of it...give it a new makeover! 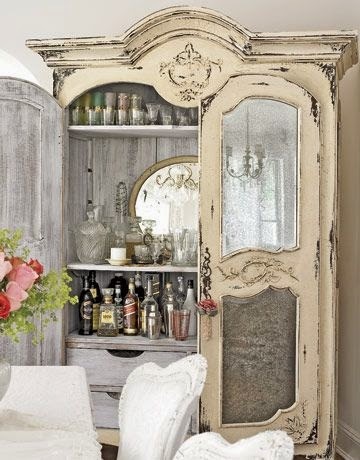 There are some great things that you can do with an armoire. They can do so much more than just hold clothes. Look at these pictures from Pinterest and see how versatile they can be. 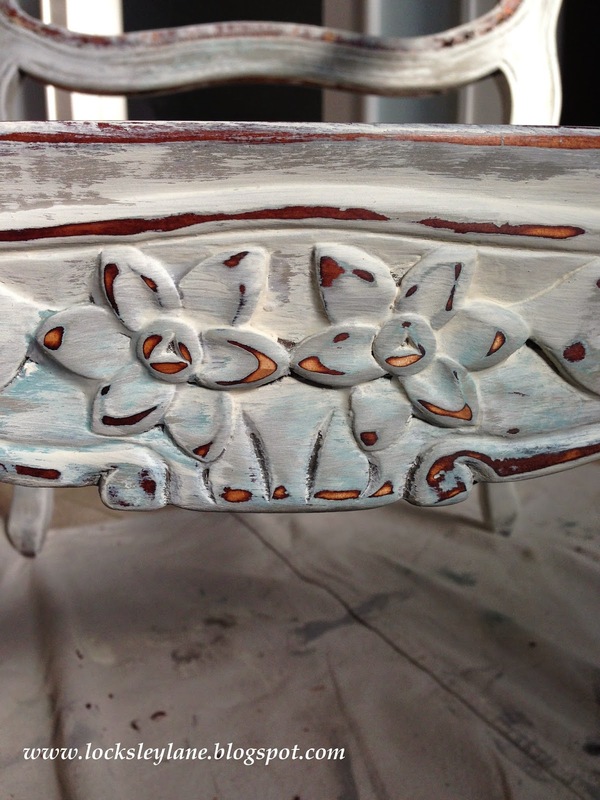 And with chalk paint, its so easy to give your furniture a new look. 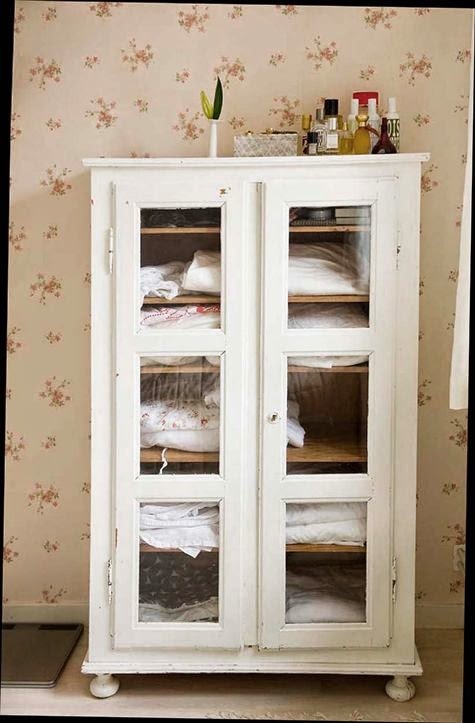 Do you have an old armoire that needs a makeover? Most of us have been taught to say "please and thank you" since the time we were little. I remember my parents and teachers emphasizing these two little words from a very early age. As a parent, I too emphasized the importance of this to my children but it usually followed a gift or kind gesture. Rarely, did we sit down just to give thanks for what we have in our lives. I was reading something the other day about the importance of having a thankful heart. I know it's important and I try to be thankful but it reminded me of how short I fall on giving thankfulness it's due presence in my life. To give thanks in all things....not just the big things. Giving thanks is something we should do daily. It's the appreciation for what we have that opens doors and allows more positive things to enter. Having a lack of thankfulness is like building a brick wall around yourself halting the energy force of life. It keeps the bad energy in. Having a thankful heart calls attention to what is good in your life. It can turn bad things into good by giving you a different perspective on a situation and reminds you of what is important. At the end of last year, I started practicing an hour of silence each week to pray and give thanks for all that I have. It's an hour of focused Adoration. Sounds easy right? But let me tell you how hard that hour really is! I go to chapel to pray and listen. No phones, no distractions....just quiet. The power of this hour has been amazing. But now I'm realizing that there is no reason that I can't have a small gratitude session every day either to start my day or throughout my day. Imagine the blessings that will come to us if we recognize the daily blessings that we already have. How can you have your own gratitude session? Take a few minutes to sit and give thanks for your life as it is today. Give thanks to others that have helped you or inspired you or brought something to your attention. Give thanks for the negative things in your life too. What?? Yes. Give thanks for what is in your life good or bad. It is during difficult times that we have the opportunity to grow and learn. Find a simple gratitude prayer or verse that you can say or read every day. Use it as a reminder to give thanks. Put it in your car visor, your wallet or on your nightstand. Whatever will create a spark in you to stop and give thanks. Be thankful that you don't already have everything you desire, if you did, what would there be to look forward to? Be thankful for your limitations because they give you the opportunities for improvement. Be thankful for each new challenge because it will built your strength and character. Be thankful when you're tired and wary because it means you've made a difference. Are you giving thankfulness its due presence in your life? My oldest daughter graduated from college this past spring. 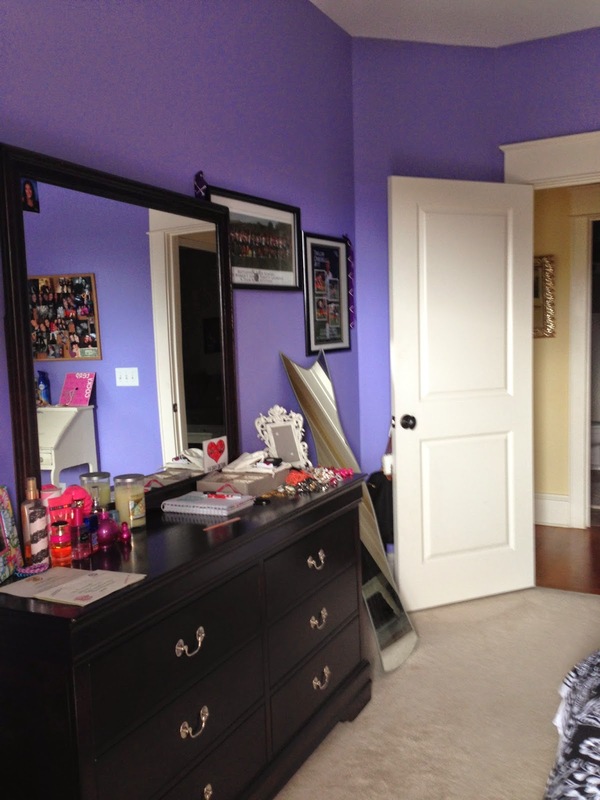 What was once a fun and happy purple in her room......now doesn't quite fit with where she is in her life. And for me, I'm ready for something a bit more subtle and soft. Gray perhaps? 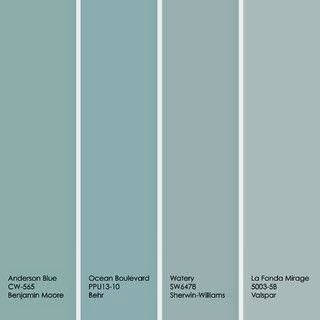 This week, I'm looking at a new paint colors and hoping to have a room makeover by the end of next week. Hope you have a great Monday. A gentle reminder to be kind to all you meet today. Looks good right? 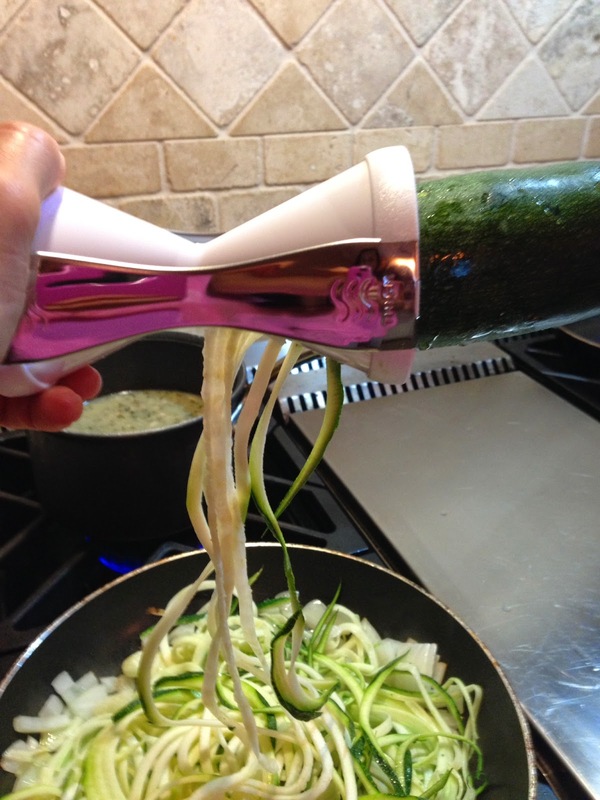 Well my Friday feature for today is this little veggie shredder. 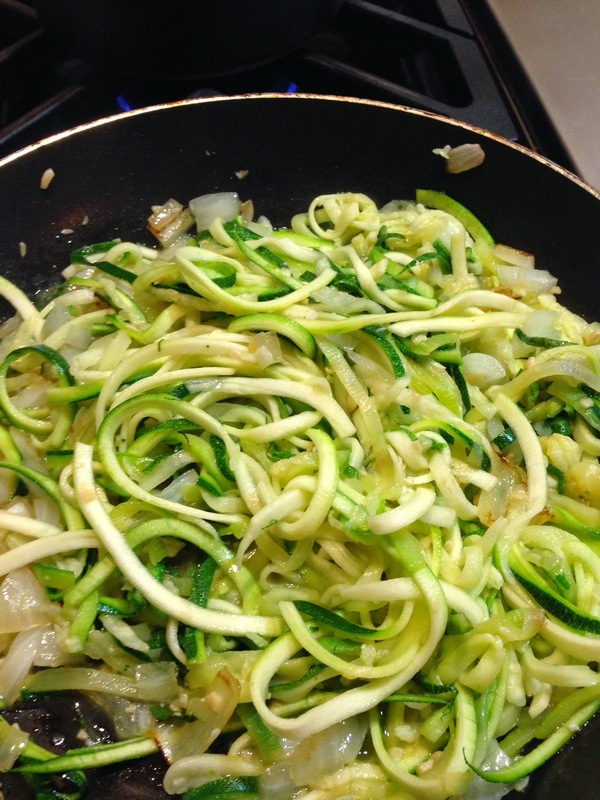 You can make spaghetti like noodles with your squash or zucchini and it is super easy to use. I tried one of the big spiral things and it was too cumbersome and a pain to clean. This is a piece of cake and does just as good a job. I put a little olive oil in the pan, chop up a sweet onion and add a little garlic. 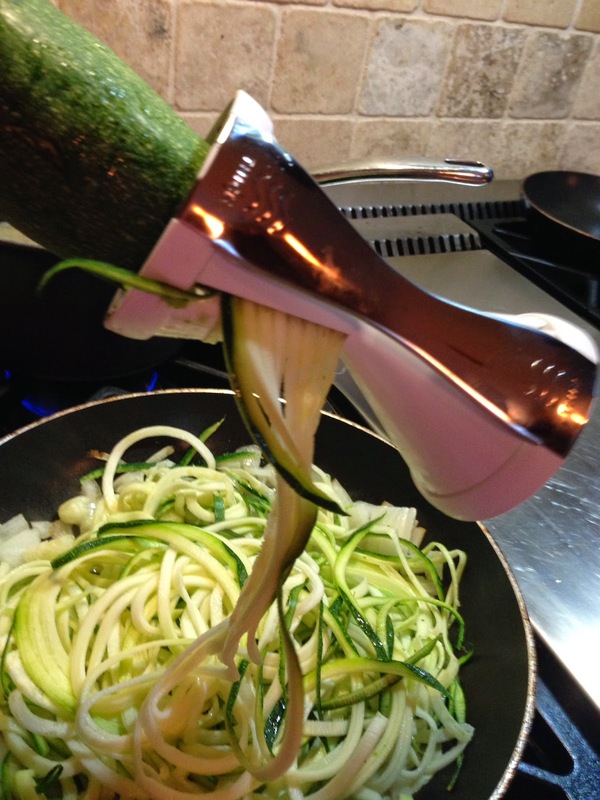 Shred up some zucchini and you are good to go. YUMM! I got this "Veggita" at Bed Bath and Beyond. Go get one and stir up some carb-less pasta! 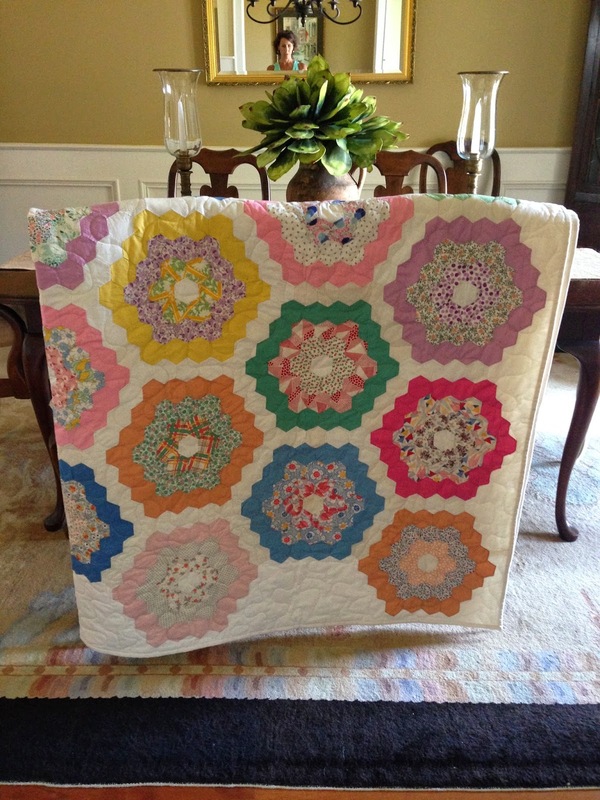 Awhile back I shared an unfinished quilt I was given that my grandmother started as a young girl. 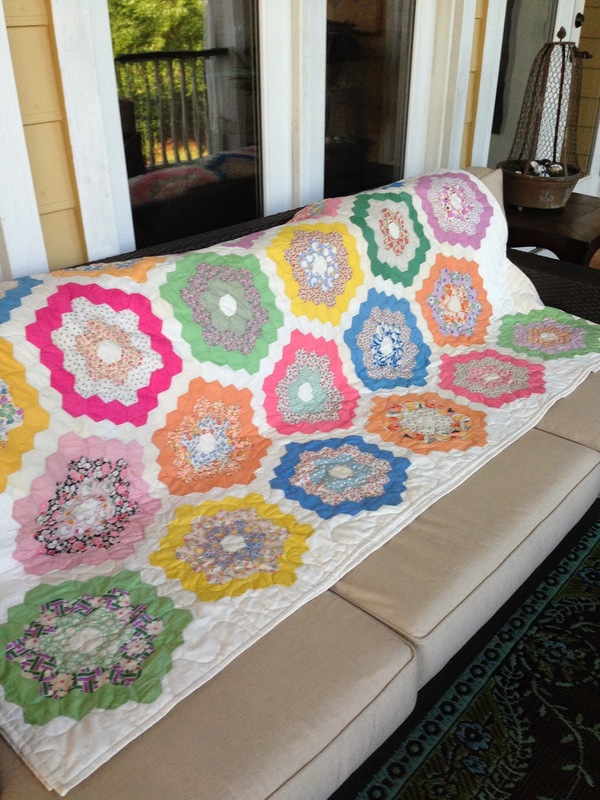 Admittedly, I cannot sew to save my life so the thought of finishing the quilt was out of the question.... But, I was able to find a very talented woman here in SC that finished it for me! 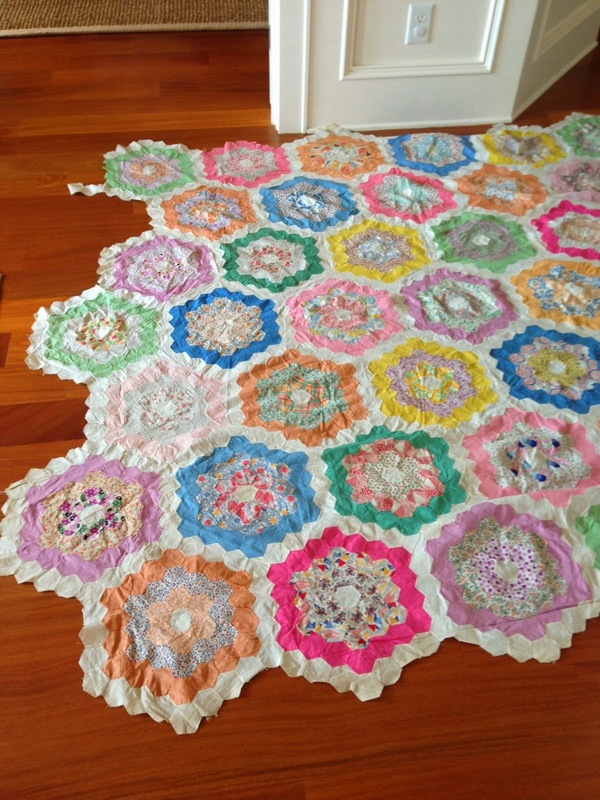 Grandma had used an old pattern which I am told is called English Paper Piecing. She got most of the quilt top together but never completed it as you can see below. I was not going to let this sit unfinished for another 50 years so I turned to quilting expert, Cheryl Wheeler in Goose Creek, SC. 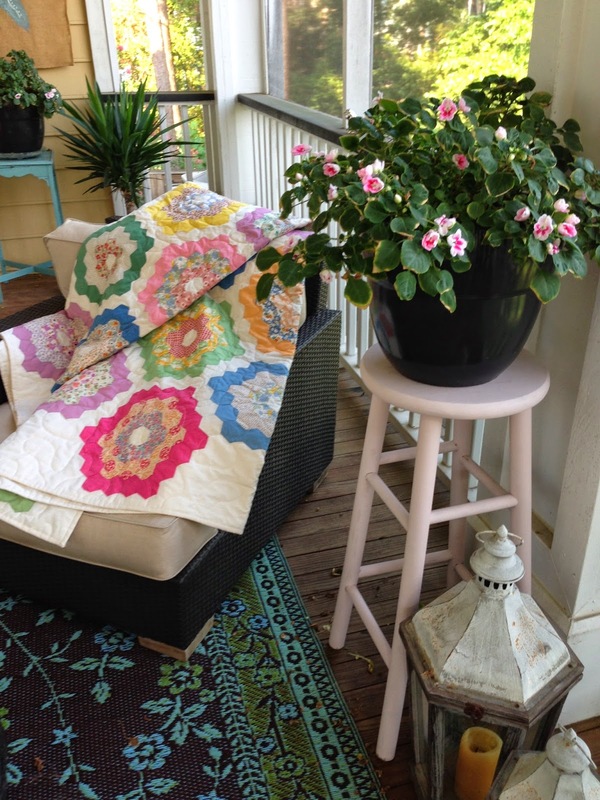 She is an accomplished quilter and works out of her home. Here are a few pictures so you can see it better. Isn't it so sweet? I am more than thrilled that it is finished and so happy to have this treasure completed. There is something comforting about an old quilt. Having one that grandma made just warms my heart. 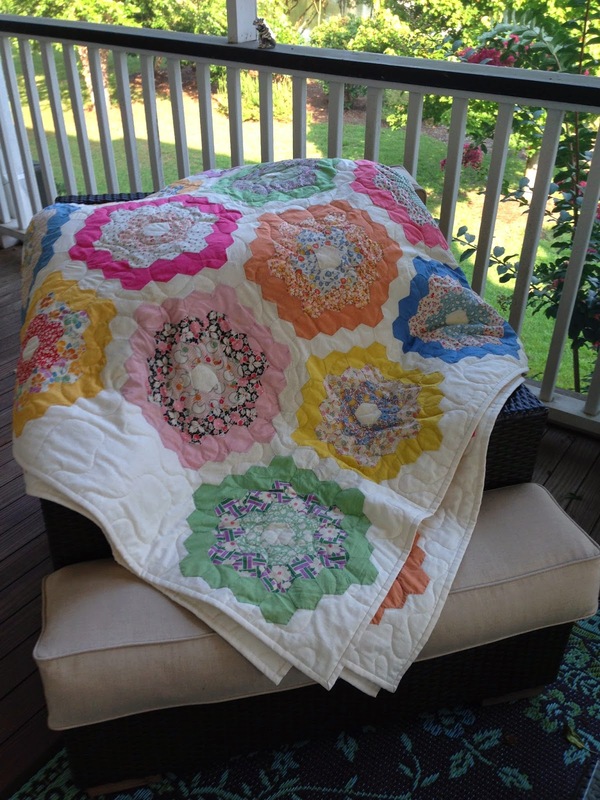 If you have an old quilt that you need help with, you can reach Cheryl Wheeler at cherylwheeler8@gmail.com. 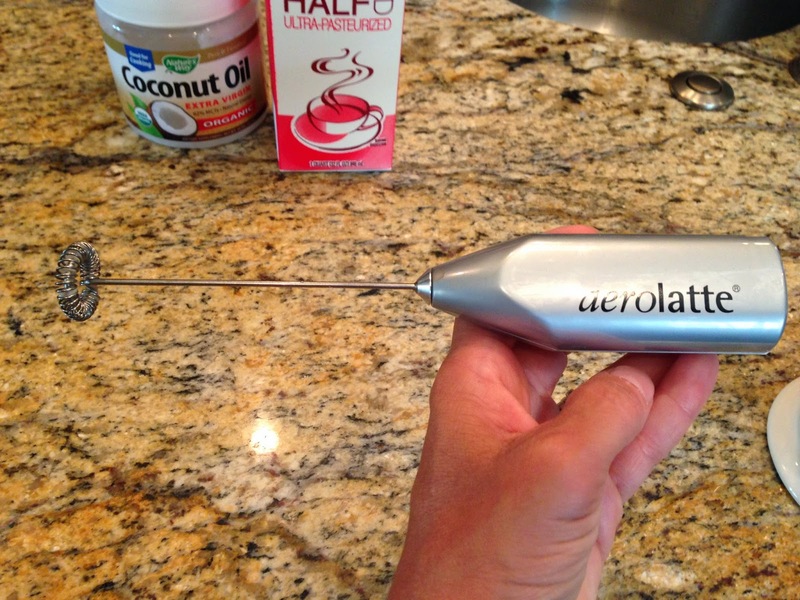 I want to share with you my new favorite kitchen gadgett and one of my new favorite health additions; a coffee frother and extra virgin coconut oil. Now, I'm not claiming to be a nutritionist but I've spoken with a few of them and I've done some research on my own and everything I've found about it is positive. Here is a quick link to one article, but don't yell at me if this isn't a good one. Do the research on your own :) But I think this is some pretty good stuff and I want to share one of the ways that I use it. Now, I'm not a big "oil" person per say...but my dad said to try it in my coffee. So I started to put the extra virgin organic (yes, those three words are important) in my morning coffee. In all honesty, it wasn't the greatest because the oil kind of sits on top of your coffee but I was willing to push through for the health benefits. Then, at the beach last week, I was introduced to a simple little frother that you can get at Bed Bath and Beyond. And let me tell you, it has changed my morning joe! So much so I want to share it with you. 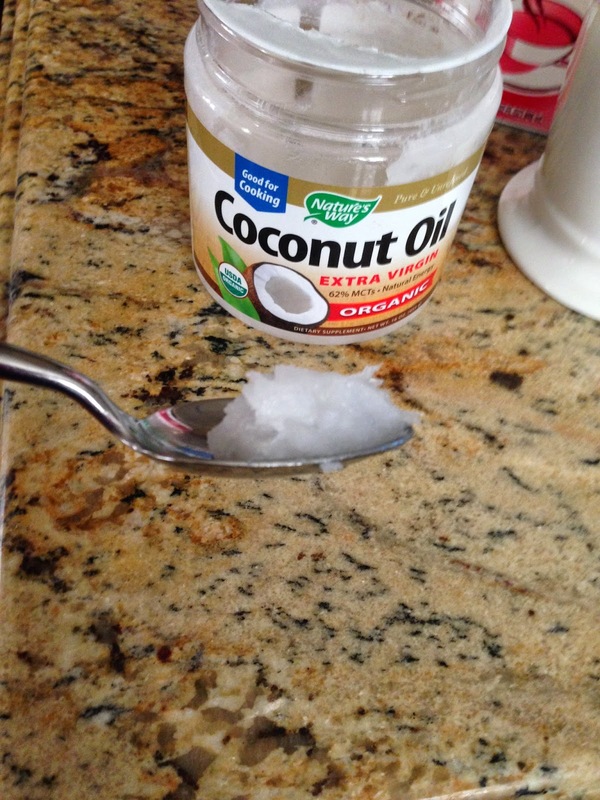 Extra Virgin Coconut Oil (I got mine at Whole Foods) is kind of like Crisco. Ugh, right? I know, bare with me here..... I take about a tsp of it and add it right into my coffee. Yep, stir that oil right in there! You can see how oily the coffee is... it just sits on top. Not pretty. Here is where the fun comes in. 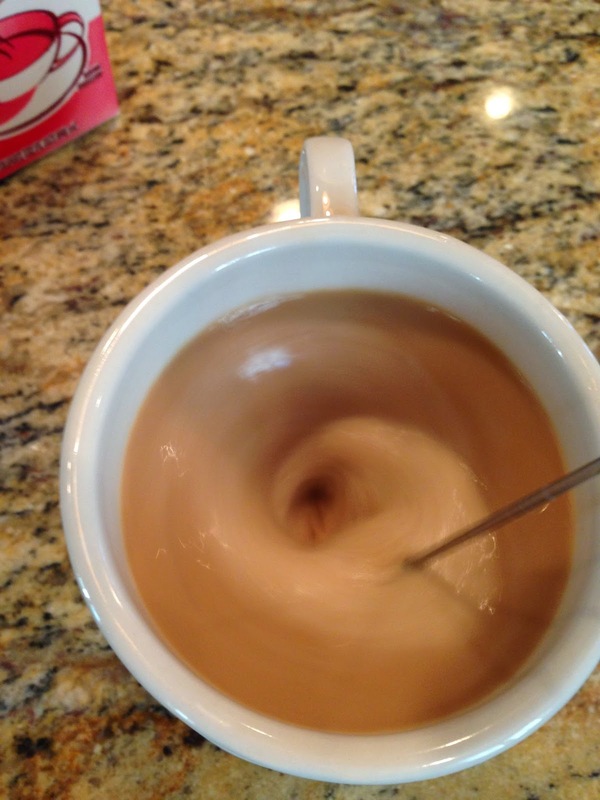 Take your frother and froth it up! Now make sure you don't have too much coffee in your cup cuz you'll have coffee all over the place. Try it in the sink first until you get the hang of it. And then, tadaaa! 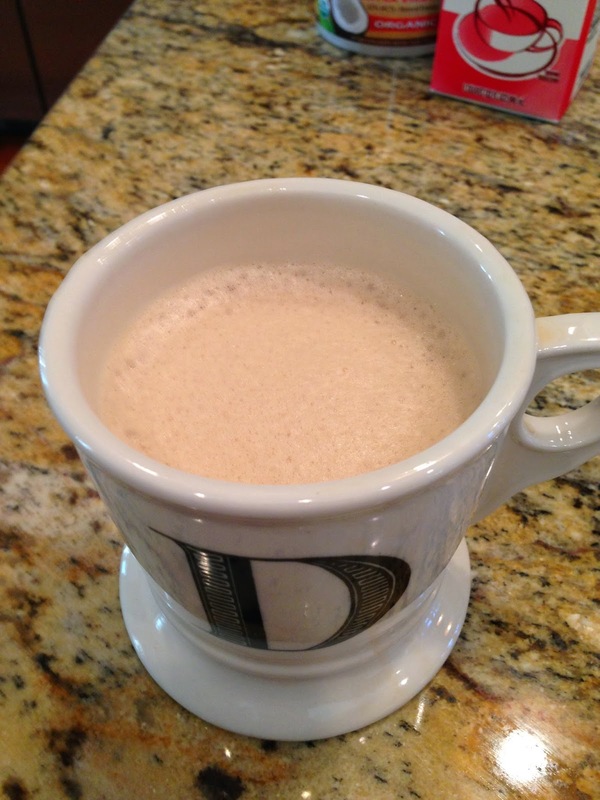 The oil mixes with the cream and you have your own coconut cappuccino! And, it's so yummy. 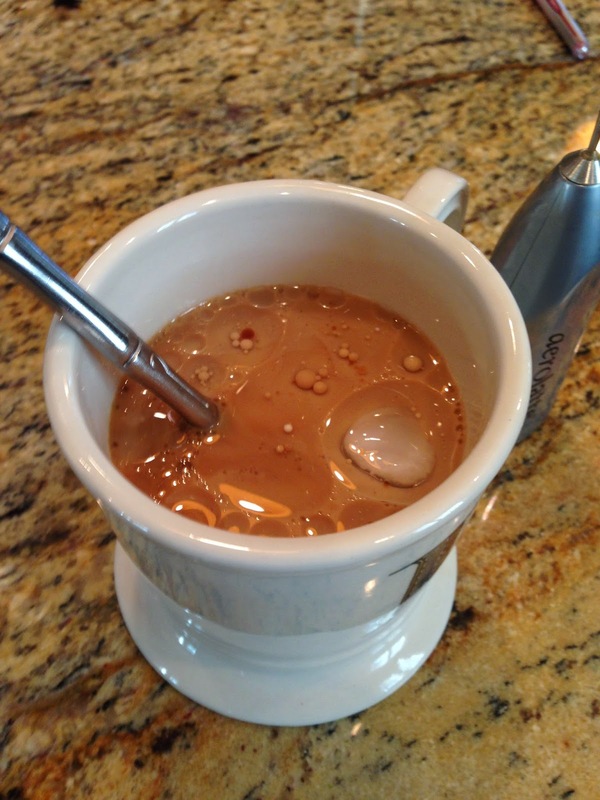 Now if you drink your coffee black you are out of luck with the frother. But you will get use to oily coffee if you want to add the benefit of coconut oil to it (it's really not that bad). 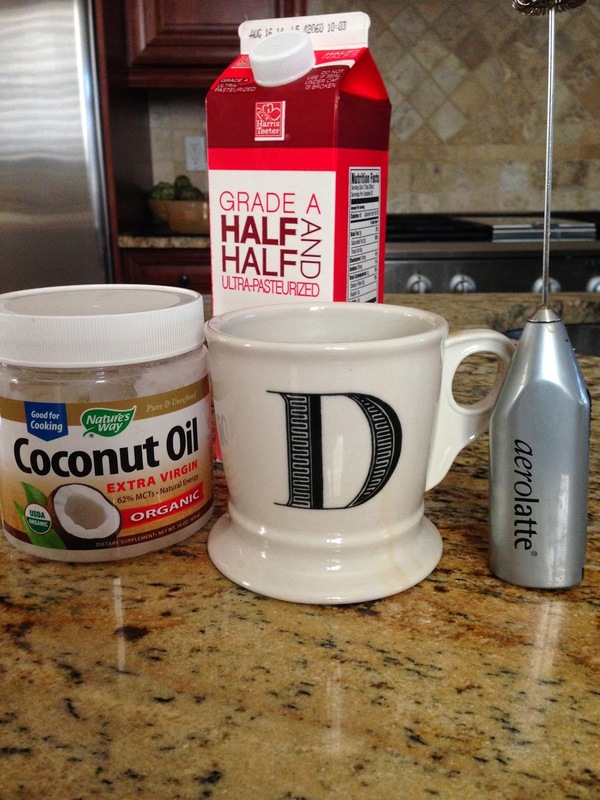 If you use cream, go get a little frother and whip up the coconut oil into a frothy cup of healthy yum! As you can see...I find pleasure in the little things these days....and this is one of them. Let me know what you think.